The voices that feature in the Seeds of Freedom trilogy are environmentalists, government representatives, food advocates and farmers. Here is a sampling of their key quotes from the film. “Once a company starts to see royalty collections from every seed, it pushes its genetically engineered crops, to replace the native crops that farmers and peasants have grown over millennia. “By controlling the seed you control the farmer. By controlling the farmer you control the whole food system. And that’s the legacy of genetics in farming”. “You create a monopoly when you’re providing the seeds which have been engineered to be resistant to the pesticides that are used on those seeds. The net effect of that, is that we’re seeing a vastly increased use of pesticides, which is one of the things that GM was supposed to be tackling. 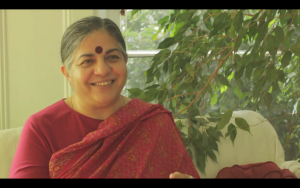 Vandana Shiva is a physicist and internationally renowned activist. 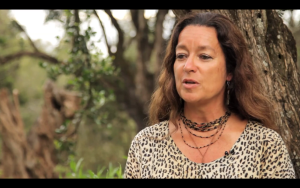 Her work highlights the fundamental connection between human rights and the protection of the environment. Dr Shiva, currently based in Delhi, has authored more than 20 books including Soil Not Oil and the 2011 report The GM Emperor Has No Clothes. She was trained as a physicist and received her Ph.D. in philosophy from the University of Western Ontario, Canada. She is one of the leaders and board members of the International Forum on Globalization, and a figure of the global solidarity movement known as the Alter-Globalization Movement. She has argued for the wisdom of many traditional practices that draw upon India’s Vedic heritage. Dr Shiva was awarded the Right Livelihood Award in 1993. Shiva’s international organization Navdanya, is a network of seed keepers and organic producers spread across 16 states in India. Dr Melaku Worede is founder of the Ethiopian Gene Bank, the first and only gene bank dedicated to the priorities of small-farmers. An Ethiopian plant geneticist, Dr Worede has been a pioneer in shifting perceptions and attitudes globally towards recognising the vital importance of on-farm diversity as a strategy to increase and conserve biodiversity. 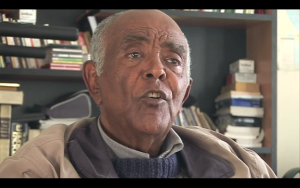 He received a right livelihood award for preserving Ethiopia’s genetic wealth. Henk is an agronomist by training. In the 1980s he worked with farmers in Peru on sustainable pest management and after that he worked with Dutch and European NGOs drawing attention to the importance of agricultural biodiversity for the future of farming. In 1990, he co-founded GRAIN and over the past two decades has helped the organisation grow into an international collective that works to support small farmers and social movements in their struggles for community-controlled and biodiversity-based food systems. Henk is the coordinator of GRAIN, and as such is responsible for the overall functioning of the organisation as well as conducting research, writing and outreach activities. GRAIN won the Right Livelihood Award in 2011. 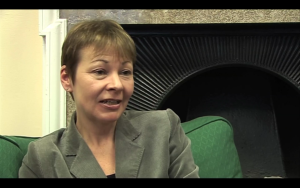 Caroline is the MP for Brighton Pavilion and leader of the Green Party of England & Wales. She is the UK’s only Green MP. A passionate campaigner on the environment, social justice and human rights, Caroline was voted the UK’s Most Ethical Politician in 2007, 2009 and 2010 by Observer readers, and is one of the Environment Agency’s Top 100 Eco-Heroes. Zac Goldsmith is a British Conservative Party politician, environmental journalist, and entrepreneur, who has been the Member of Parliament (MP) for Richmond Park since 2010. 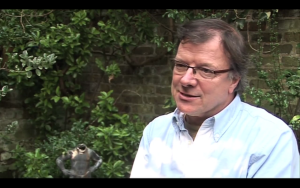 From 1998 to 2007, Zac was editor of The Ecologist magazine. During this time, he became a London campaigner and commentator on environmental issues including climate change, GM food and pesticides. In between his work with The Ecologist and the Conservative Party, Zac raises funds for groups around the world dealing with a broad range of environmental and conservation issues. In September 2009, Zac’s book, The Constant Economy, was released. It looks at the key environmental problems we face, and provides a workable programme for action. John Vidal is the Guardian’s Environment Editor. He joined the paper in 1995. He is the author of McLibel: Burger Culture on Trial (1998) and has contributed chapters to books on topics such as the Gulf war, new Europe and development. Ramón Vera joined GRAIN in 2009. He is the overall editor of Biodiversidad, a quarterly magazine produced in collaboration with 10 partners in the region. He also works actively with the rest of GRAIN’s Latin America team in advancing our programme in the region. In addition, he edits the Mexican monthly Ojarasca, translates international writers for the Mexican newspaper La Jornada and is actively involved in the struggles of indigenous peasants in his country. Percy Schmeiser is a farmer from Bruno, Saskatchewan, Canada. He specializes in breeding and growing canola. He became an international symbol and spokesperson for independent farmers’ rights and the regulation of transgenic crops during his protracted legal battle with agrichemical company Monsanto Company. He was the subject of the 1999 film David Versus Monsanto.